Social media are, suddenly, fashionable. But how many firms proclaiming knowledge in the area also understand how to build brands using social media? Read on about our nine goals with social media. 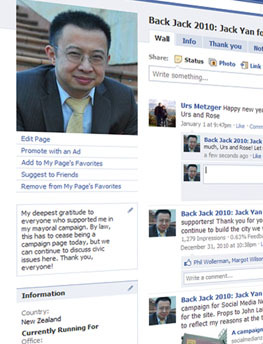 When our founder, Jack Yan, ran for Mayor of Wellington in 2010, he scored 12 per cent of the votea respectable outcome for a first-time campaigner. His techniques: our social media knowledge. Every question answered, every citizen engaged. The pollsters, not understanding the power of engagement, had him as low as 2 per cent weeks from the electionbeating that sixfold was a vindication of our methods. Jack dissects the rationale behind his use of social media at Social Media New Zealand. We hear about social media a lot. There are an awful lot of people proclaiming to be experts. But we bring something different to the table: an understanding of how social media build brands. It goes beyond just setting up a Facebook page or a Twitter account. We have helped organizations bridge the gap between their strategies and their audiences. The aims for brands in any social media strategy must, then, serve the organization both internally and externally. We understand that its not the quantity of Facebook fans or Twitter followers. Its about the quality of engagement and how well youve built your brand with customers, suppliers, peers or any other group you should reach. We have our nine goals of social media brand-building. The organization must use social media to (a) build a sense of membership or citizenship with the organization, (b) encourage the acceptance and communication of brand values, and (c) encourage the audience to engage in dialogue and promote the brand. Strategically, that dialogue can (d) help the organization find and maintain a competitive advantage; (e) inform the vision behind the brand and build differentiation for it; and (f) act as a check on whether the brand is being properly communicated and understood by the audiences. The consequences are to (g) build positive brand associations, (h) build the perceived quality of the brand, and (i) build greater awareness of the brand to audiences that it has not yet reached. Weve really thought about itand weve been practising it for most of the last decade.